June 4, 2018, 2:58 p.m.
Apple News comes to the Mac, breaking news alerts get a little extra scrutiny, Siri learns a few new tricks, and the web — or some version of it — comes to your wrist. 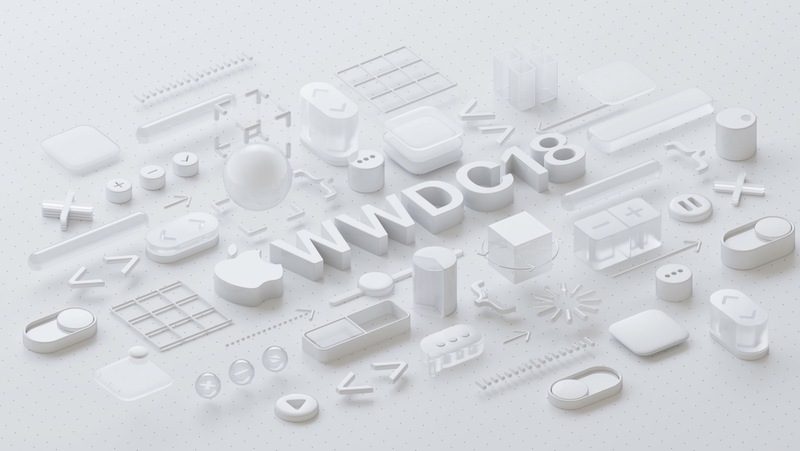 By Joshua Benton @jbenton June 4, 2018, 2:58 p.m.
Today is the second most important day of the year for Apple: the start of its annual Worldwide Developers Conference, when thousands of app builders descend on San Jose to learn what the company has planned for them. And while the annual September iPhone launch might be more important for Apple, WWDC is the most important for news publishers, since it’s where the OS-level announcements that most impact them are made. The keynote ended moments ago, and there were a surprising number of updates and changes worth knowing about. Here are the big ones. Apple News comes to the Mac. 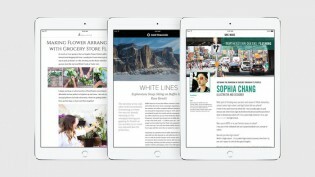 Three years ago, Apple announced the latest iteration of its strategy for publishers. The old, awkward Newsstand… — app? folder? what was it again? — was dead; taking its place was a new app called Apple News that would be a shared platform for publishers — think Facebook Instant Articles, minus the Facebook. Initial results were underwhelming, but usage, traffic, and user experience all improved over time; many publishers now think of Apple News as their second-most important distribution platform — behind Facebook, ahead of Twitter, Instagram, and Snapchat. Now, you may be asking: Hey, didn’t everybody move to mobile? Why should anyone care about nasty old desktops and laptops any more? Good point, Nieman Lab Reader! Just about any way you measure it, Internet traffic on desktops and laptops has either plateaued or declined slightly as phones have become our favorite screens to stare at. (See slides 11 and 97 here for visuals.) The Mac has something like 100 million active users worldwide; the number of active iPhone and iPad users is around 1 billion. Holy addressable market! 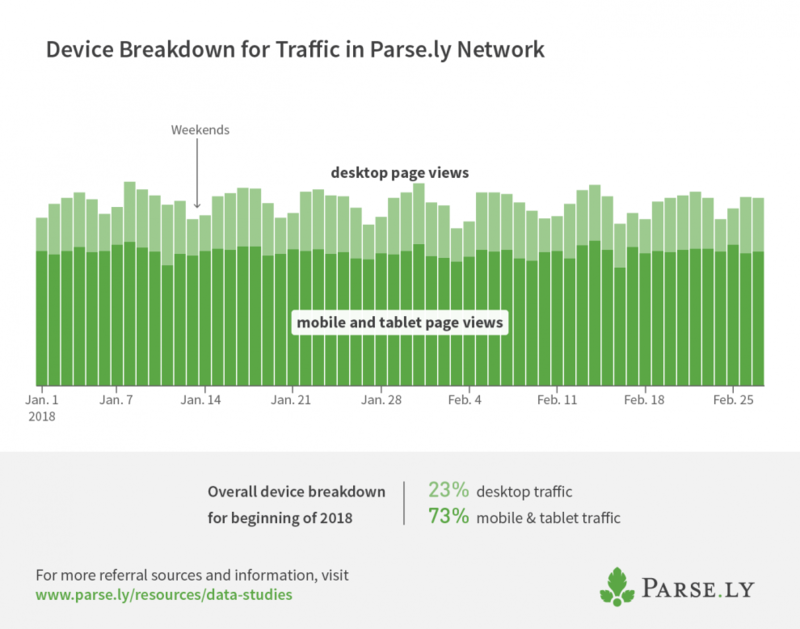 News audiences have moved to mobile too, with 3-to-1 mobile/desktop splits now common. That said, desktop is still a very important driver of traffic during the daytime on weekdays, when many millions of people are sitting in front of a screen much bigger than a phone’s. For a print dude, so interesting to watch chartbeat at 5pm, and see majority of readers jump from desktop to mobile. it's like watching a movie of your job. Desktop’s share varies from site to site — I’d wager TMZ’s audience is very mobile all day and all of the night — but for niche sites that are in any way work-related, desktop can still be king. For instance, here at Nieman Lab, our web traffic so far in 2018 has been 57 percent desktop, and its peaks match workday hours pretty closely in whatever time zone you’re visiting us from. It didn’t take long after the debut of the iPhone for publishers to figure out user attention was moving from web browsers to separate apps. But for some reason, that same transition never happened on desktop. If Apple can use push notifications artfully and get the user experience right (which I broadly think they have on iOS), maybe Apple News will become the thing some people command-tab to when their brain needs a break instead of twitter.com. Speaking of the desktop. Wondering why Apple News on Mac looks almost exactly why Apple News on iPad? Turns out it’s basically the same app. Apple announced it is planning to make it possible for developers to easily convert their iOS apps to Mac apps. This won’t be available to developers until 2019, but several of the new macOS apps — including Apple News — are actually built using those conversion tools. It’ll be a year until it impacts consumers, but this means that every publisher with an iOS app — which is an awful lot of them — will be able to pretty easily have a Mac app. So there can be a New York Times Mac app, a Guardian Mac app, a CNN Mac app, a Google News Mac app, a BuzzFeed News Mac app — without much effort. It also means there can easily be a Facebook Mac app, a Twitter Mac app (again), a Pocket Mac app, a Headspace Mac app — everything. Every company that until now thought that the Mac was too small of a platform to be worth maintaining a separate code base will now get a Mac app without doing much at all. One final cross-device thought: If Apple News can move from iPhone to Mac, why can’t the Podcasts app? Podcast listening is an intensely mobile activity, so it likely wouldn’t see the uptake I expect Apple News will on desktop — but it’d be a chance for the industry’s most important platform to further entrench itself while reaching new audiences. Maybe most important for publishers will be a set of new policies around notifications. One new feature called Instant Tuning will allow users to easily stop notifications from a particular app from appearing on the lock screen. On one hand, that’s a little terrifying for publishers — notifications are a critical way publishers direct attention to their work. On the other hand, though, making notifications simply skip the lock screen (but still appear in the total notifications list) is better than turning off an app’s notifications altogether. And without any granular options available beyond on/off, off was awfully tempting. Still, this means notifications will only be deemed valuable by iOS if the user interacts with them. That’s unfortunate: A lot of the work of the recently ended Guardian Mobile Innovation Lab was around making rich notifications useful even when the user doesn’t tap through. And now Siri will also recommend you turn off an app’s notifications if you haven’t interacted with them in a while. Basically, you’ll have to be more careful about what you decide is alert-worthy. — Hey Siri, what are the Times’ top stories right now? — Hey Siri, has anything really important happened in the past few hours? — Hey Siri, what’s the latest on the Trump Russia investigation? We won’t know the technical details for a bit yet, but the demo showed Siri commands that don’t include a specific app’s name. (So it doesn’t have to be “Hey Siri, does The Washington Post think anything really important happened in the past few hours?” The Siri command landgrab awaits.) It’s unclear how flexible they’ll be — will apps be able to pull in variables from a command (“Hey Siri, what’s the latest news on _________?”) or whether every command will need to be tightly scripted. This, alongside Amazon’s skills framework, is the best opportunity for publishers to get thinking about what sort of voice interactions they think their users might find valuable. I don’t expect to see a ton of pickup among users in the near term, but it’s a great thing to be thinking about. ARKit gets shareable. I confess I thought we’d see more (and more interesting) uses of the augmented reality capabilities that were added to iPhones and Android phones last year. There’ve been a few one-offs from publishers, and a handful of places (like the Journal and Quartz) that have devoted a bit more effort. But it’s still far from mainstream. ARKit 2, the new iteration of Apple’s AR toolkit, has a few nifty features, like letting the same AR objects exist within multiple people’s devices at the same time. So at a public event, for instance, some noteworthy object or individual could be “placed” in a space where multiple people in the audience could use their iOS devices to see it at the same time. Apple is also getting on board with a new file format, USDZ, that will de-abstract AR objects into files that can be shared across apps and platforms — or even published on the web. Cool! But realistically, I think it’ll still take a mainstream AR glasses option to prompt anything like mass adoption. The web on your wrist. watchOS and tvOS are the also-rans for publishers among Apple’s operating systems lineup, but there was a little of interest to publishers. Maybe most significant is the addition of WebKit to watchOS 5; that will let you view web content on your wrist. (At least some kind of web content, in certain specific contexts — emails and text messages were mentioned. Steve Jobs might call it “the baby Internet.”) No matter how limited it may be, this is likely the most flexible Apple Watch canvas for publishers yet. Apple Watch does continue to grow impressively, up 70 percent in 2017; should any content producers ever figure out what the hell to do with at 42mm screen, there’ll be an audience for it. More anti-tracking efforts. I admire Apple’s restraint in not mentioning “Cambridge Analytica,” but its usual promotion of its privacy bonafides did take a shot at Facebook, referring to “like buttons and comment fields” that can track you across sites. “This year, we are shutting that down,” Federighi said. Safari will make you confirm you want Facebook to track you via like buttons (I’m guessing most won’t!) and add anonymization features that make it harder for ad networks to identify you individually by using tech details about your device. This will happen on Safari on Mac — but also, much more importantly, for iPhone and iPad Safari too. I felt a great disturbance in iOS, as if millions of ad-tech companies suddenly cried out in terror, and were suddenly silenced. A renamed Apple Books. What has been iBooks gets what looks like a very attractive visual refresh, borrowing a lot from the App Store editorial-centric redesign last year. And it gets a new name! Apple Watch, Apple News, Apple Books…I’m sensing a trend. 32-way FaceTime. Realistically, most publishers won’t want to be limited by an Apple-only platform, but the prospect of OS-native real-time 32-way video chats brings to mind tons of engagement and virtual event ideas. POSTED June 4, 2018, 2:58 p.m.
Benton, Joshua. "Revenge of the desktop: These are the most important announcements Apple made for news publishers today." Nieman Journalism Lab. Nieman Foundation for Journalism at Harvard, 4 Jun. 2018. Web. 24 Apr. 2019. Benton, Joshua. "Revenge of the desktop: These are the most important announcements Apple made for news publishers today." Nieman Journalism Lab. Last modified June 4, 2018. Accessed April 24, 2019. https://www.niemanlab.org/2018/06/revenge-of-the-desktop-these-are-the-most-important-announcements-apple-made-for-news-publishers-today/.